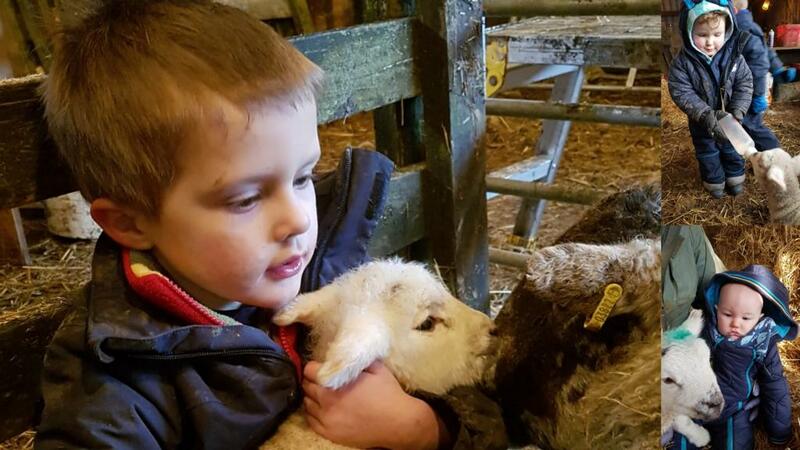 Following on from her insight in to life on farm with a newborn baby, Georgina Fort tells us why she wants her little boy, Alexander, to have the farm upbringing she did. Generally it doesn’t seem that long ago since I was a child, but as I’m sat here mulling over a glass of wine trying to remember my childhood actually, it really seems a lifetime ago. I suppose the stand out moments must be the weather. In my head it was always sunny but perhaps that’s because I’m dreaming of some currently. I always felt at ease on the farm. When I was younger, I hated leaving it, even to go to school. I think it’s the freedom you have to wander around the garden or the yard, and not have to worry about the busy streets or keeping the noise down. But I suppose growing up on a farm means you are given big responsibilities from an early age. I must have only been about eight years old but I remember we were struggling for staff - my older siblings had either left home or were at college and Dad was trying to lamb whilst also milking. I knew how to hang units on as I had been milking since I was about four years old, but Dad needed to go and lamb a sheep so I was given the task of watching the cows and letting them go once they had finished. However, on no uncertain terms was I to get anymore into the parlour. Now, I’m not one for following instructions very well and by the time he came back, I was hanging another row of cows on. Good job we had quiet cows isn’t it? Being a family farm, finding reliable staff was never easy so this became a regular thing. The responsibility instilled some independence in me at a young age and taught me an abundance of life skills that are still with me today. I suppose I owe my parents a lot. Not many children get the kind of leash we got as kids. We weren’t unruly, but the jobs we were given made us independent whilst learning the valuable lesson of ’you need to work hard to get anywhere in life’. Also, we learnt the importantance of having animals in our lives. Cows were, and always will be, a huge part of my life. I’ve always loved them and their little ways and I still admire the intelligence of these animals. As I look to my own son now - although he’s only four months old - I hope he too can enjoy his younger years growing up on a farm. His childhood has started slightly different to mine though. My mum never worked on the farm so until I was walking, I didn’t venture out there that much whereas Alexander has already witnessed cows calving, milking, slurry tanking and much more. But the basics are still there, like running around in the fresh air. Being given little tasks that might seem nothing to an adult mean so much to child. Alexander isn’t the only child on the farm as I work alongside my sister, so her two children are usually around. Isaac is five and Hattie is three and they’re are both at the age of being quite useful. They absoltely love it. Only this week, Hattie had told her nursery staff that she had to do all the milking over the weekend (I’m not entirely sure she’d even been in the parlour that weekend but there we go!) and Isaac had told his school friends what we feed the cows - and how they love eating carrots. You can’t help but smile at their enthuasim for animals and farming at such a young age. It makes you wonder what non-farming kids talk about. I’m sure in the next couple of years, Alexander will be telling us about his farming day and sounding rather like an old man, not a child. No matter where we are in the world, as farmers we are all one big family and can relate to one anothers upbringing and probably have children talking about similar things at school.